The Business Advantage Cash Rewards Mastercard currently has an Informr score of 8.2 out of 10. This score is based on our evaluation of 10 sources including reviews from users and the web's most trusted critics. Business Advantage Cash Rewards Mastercard is typically available to those with excellent credit scores (650 or greater). A pretty straightforward cash back credit card that rewards everyday spending: gas station, office supply store, and restaurant purchases especially. However, with relatively few frills, this card isn’t appropriate for business owners who like to travel or party in style. This cash-back card is best for businesses that spend a lot at gas stations and office supply stores. That said, the card can also be highly lucrative for any business simply looking for a cash-back card. A good pick for business cardholders who are often on the road, the Business Advantage Cash Rewards Mastercard offers a generous cash back bonus on gas, office supply and restaurant purchases. On purchases within the first 90 days. - Get a 75% rewards bonus on every purchase when you're a Business Advantage Relationship Reward Platinum Honors tier client. That means you will earn 5.25% on your selected choice category, 3.5% on dining and unlimited 1.75% cash back on all other purchases. 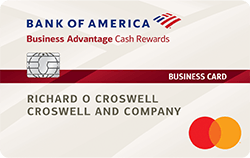 If your small business has banking relationships with Bank of America and you can qualify for bonus rewards and other perks with Relationship Rewards, the Business Advantage Cash Rewards card is a great choice. If you don’t bank with Bank of America and aren’t spending most of your money on gas or office supplies, look elsewhere for a card that provides better than 1% rewards for the purchases you most often make. The Bank of America® Business Advantage Cash Rewards Mastercard® credit card combines solid cash back rewards with a 0% introductory APR on purchases for 9 billing cycles. Card users will earn 3% cash back on purchases at gas stations and office supply stores, 2% on purchases at restaurants, and 1% on all other purchases (on up to $250,000 in combined gas station and office supply store purchases annually, 1% after that). If your business spends thousands of dollars on gas and office supplies per year, then Business Advantage Cash Rewards Mastercard credit card by Bank of America is a solid option to consider with its 3% cash back in these categories and no annual fee. You may also want to take advantage of the 0% introductory APR on purchases for the first 9 billing cycles if you’re looking to make a large initial purchase for your company. Bank of America Business Advantage Cash Rewards Mastercard credit card can be a very rewarding cash back card to use if you make a lot of purchases at office supply stores, gas stations and restaurants, especially for businesses with a bigger budget. The Business Advantage Cash Rewards credit card isn’t the most rewarding card out there, and it’s not packed full of premium benefits. That said, it is a solid option for a no annual fee business credit card. It offers reasonable rewards for everyday spending, and redemptions can be made simply with a $25 minimum. This card is most ideal for small business owners whose spending falls most often in the restaurant, gasoline, and office supply categories, and it's even more ideal if your gasoline and office supply purchases don't exceed $250,000 per year due to the cap on the 3% category. If you spend big, like up to $250,000 annually big, in combined gas and office supplies purchases, the Bank of America Business Advantage Cash Rewards Mastercard will give you the best rewards out of the small business card bunch. But unless your spending is targeted primarily in those areas, other cards have the potential for greater rewards.